by Garry A. Flint, Ph.D. Process Healing is a treatment intervention that is very good with all emotional problems. It is especially useful for persons interested in personal growth. We all have negative experiences in our youth or as adults. These experiences frequently intrude in our thoughts and actions. Negative experiences do not feel good and reduce our quality of life. With this treatment process, one can gradually eliminate negative beliefs, memories and experiences. This healing leads to personal growth. It is accomplished by using your inner-self healer. I call it the subconscious. The subconscious is especially useful in everyday applications. It can learn to heal negative beliefs, memories and experiences just in the course of life. This means it can operate to automatically reduce emotional pain interfering with our quality of life. Also, you can simply ask him/her to treat negative beliefs, memories and experiences as they arise. Sometimes my patients feel like a different person each day for a number of days after the first session. This process can certainly facilitate personal growth. Process Healing is taught with metaphors that describe the development of the subconscious, the main personality, amnesic parts, dissociative parts, brain functions and other constructs that can be used to treat difficult emotional issues. I have refined the process over the last nine years. It works because the metaphors seem similar to the experience of personality parts, memories and the subconscious. All brain functions and body activities are assumed to be the effects of memory activity. Therefore, when necessary, one can attempt to treat any behavior, brain or body issue by using the subconscious. Process Healing is particularly good for healing traumatic memory parts. Parts, as used here, refers to amnesic parts, dissociative parts, active memories or any aspect that has emotional or physical pain and wants to be healed. With all people, there are usually some amnesic parts that were formed in utero, at birth, in an accident, in a near death experience or in a trauma. The treatment of some people is extremely complex and others straightforward and routine. The treatment of most people is usually routine. The leverage for getting parts to heal is that all parts want more satisfaction and less pain. If they don’t, the barrier for healing can be resolved. 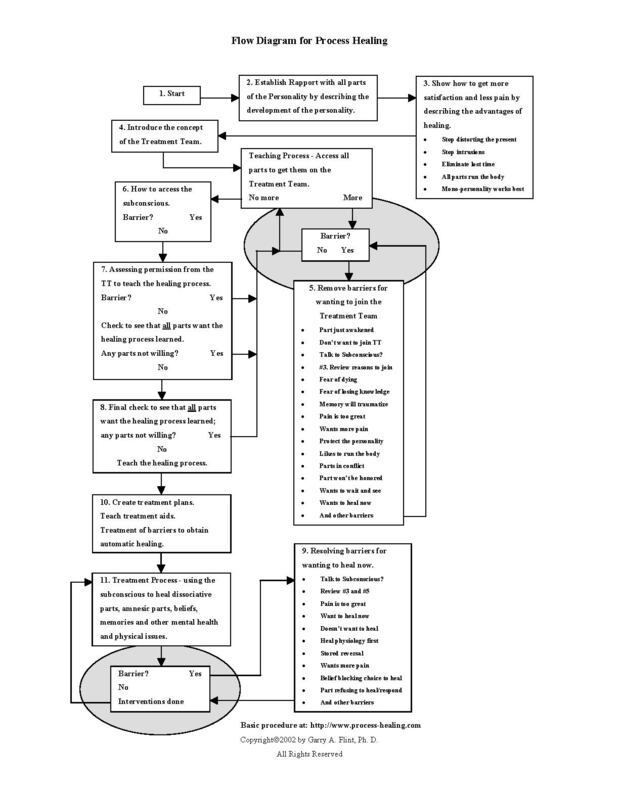 The flow diagram herewith describes the steps taken when teaching Process Healing. This involves first organizing the personality system and, later, engaging in the treatment process. I will walk you through the flow diagram. Organizing the system requires getting rapport with all parts of your personality. When you talk to the main personality (MP), you also communicate to all parts of your personality that are awake (2). They hear the communication. The description of the development of the personality is an important step in the teaching the treatment process and establishing rapport. Here’s how it’s done. The therapist talks and draws the figures on the paper shown on the diagram. I start by showing the timeline of, first, the development of the subconscious (a) (S) and then the development of the main personality (b) (MP). The subconscious starts developing first. I point out that words and phrases are learned in some form of memory while in utero. These words and phrases are later associated with objects and actions after birth. This causes the language of the subconscious to start working. This language of the subconscious continues to develop during the remainder of a person’s life. The main personality develops in a similar way. As we behave, we add to a memory that is used to run the body. This memory starts before birth and expands during the remainder of our life. All memory is always active, waiting to be triggered into experience. If a memory is not in our experience, it is dormant or asleep. Our behavior is formed in what I call the active experience (AE) (c). All internal and external stimulation, active behavior memories, emotion memories, unconscious processes and our last response are in the active experience. Some of these active memories form a collage of memories to give us our next response. What we think and do are primarily collages of previously learned memories. We use the behaviors formed in the active experience to survive. The dissociative process (d), which causes the conscious and unconscious experience, is gradually formed adaptively to exclude unnecessary information from our conscious experience. The association process (e) has the same function, but it works with our entire personality memory. When the association process is damaged by trauma, we may see loose associations, which gives us too much information, or concrete thinking, which cuts off information and the ability to understand metaphorical comments. The presentation continues with a discussion of the time-line of a traumatic experience (f). This is important in the explanation of the formation of amnesic parts. Curiously, when there is no memory that is relevant to the situation to form a response and the emotions are intense, the brain takes over and mobilizes the most appropriate behavior to try to survive (g). This rapid mobilization results in the formation of an amnesic trauma part. The brain mobilizes and pushes the main personality (MP) to sleep. It doesn’t experience the trauma. The behavior or active memories during the trauma becomes the memory of the new trauma part. The trauma part (TP) is later pushed to sleep at the end of the trauma by the return of the main personality (MP). The main personality leaves and later returns to the active experience so quickly that there are few associations between the main personality and the trauma part. This is the cause of amnesia, which keeps the main personality from knowing what happened during the trauma. Crucial to establishing rapport is explaining how intense pain is treated without abreactions or emotional flooding (h). An individualized treatment plan is developed for each member on the Treatment Team (4). Each treatment plan involves slowly healing the trauma from start to finish by treating some pain and waiting briefly before treating the some more pain. In this way, the chance for emotional flooding is eliminated. This results in all the pain being removed from the traumatic belief, part or memory. The emotional pain is replaced by current active neutral or positive emotions. After the pain is removed and replaced with neutral or positive emotions, integration can take place. You talk about the integration of parts (i) noting that all parts retain their unique structure and no information is lost. Integration involves the main personality and the trauma part exchanging memories until both have the same memories. After integration, they all get to run the body without conflict because they have identical memories. All integrated parts are able to participate in running the body and experience good times. The organizing process involves your convincing parts to join the treatment team (j) by stressing the reasons for healing (3) and also by explaining away the reasons for not healing or joining the treatment team (5). Members of the treatment team will all want to heal their emotional pain, join with the main personality and work on a consensual basis. You will establish communication with the subconscious (6) by using finger responses for “yes,” “no,” “I don’t know,” and “I don’t want to tell you.” No response is a response too. This is a hypnotic technique but usually you do not have to go into trance. By using finger responses, your communication with the subconscious and other aspects of the personality is made easy. It gives you a way of recognizing problems and solving problems. The organizing process is continued until all parts are on the treatment team. Respect of all parts of the personality is shown in the following way. Several checks are made to be sure that that all parts are on the treatment team and that they all want the treatment process taught to the subconscious (7). A further check is made to see that no parts remain with considerations (8). When you are certain that all parts are on the treatment team, the treatment process is taught by means of a simple metaphor that most always works with patients age 7 to 85 (8). After the subconscious is taught the treatment process, treatment plans are created for all members of the Treatment Team and barriers are removed to enable automatic, and independent treatment by the subconscious. (10). This method of treatment is the most respectful of all treatments. Independent treatment by the subconscious is really a great personal growth process. When freed to heal, the subconscious will heal all negative beliefs, memories, and experiences and aspects just in the course of life. People who are using this process often notice the treatment process working during the day. Some of the experiences that people feel when the process is working are the feeling of numbness in the head, slight head ache in the fore brain, prickly feeling in the brain, sensations in different locations of the brain, orfeelings in the body. Sometime, pictures or words are experienced. When there is a lot of treatment, a person may become tired or sleepy. It can go on for days if there is a lot to do. When a person has a trauma in his/her history, some professional treatment might have to be carried out to move towards personal growth. Treatment intervention (11) involves healing parts, painful memories, self-limiting beliefs, personality traits, and the basis for addictive behaviors. Problem-solving is sometimes needed to work with parts that awaken and don’t know what is happening (9). With most of the parts on the treatment team, there is much less difficulty healing problems than otherwise. Usually within the first 1-½ hours of therapy, a therapist can get the treatment process taught and demonstrated by treating one simple phobia (12). This is a very good method for overcoming barriers to personal growth. By using the subconscious and asking questions, barriers can be identified and healed. The model borrows concepts from learning and chaos theory. This provides a rich basis for problem-solving or even creating new memory constructs that lead to treating the problematic behavior or memory. Of course this may require a skilled practitioner who is especially good at creative problem solving. But in most cases with relatively normal people, Process Healing will be a welcome resource to use on the path of personal growth. Process healing is available free on the Internet. Access to the PDF file of the Process-Healing course is given below. When doing it at home, one may have to read the Process Healing course several times before permission is obtained to read the metaphor teaching the healing process to the subconscious. Many persons who have downloaded the Process Healing course have obtained good results. To download a free course teaching you the basics: send a post to: free-ph@emotional-freedom.com. possible to change beliefs and heal painful memories and experience. Based upon clinical experience, learning theory, and chaos or complexity theory, this metaphor gives rise to a personality theory and treatment process that the author believes will be understood by all aspects of one's personality. personalities. He is the author of Emotional Freedom, which is also published in Japanese and will soon be published in Spanish. Gary Flint lives in Vernon, British Columbia, Canada.